Sujiith Vaasudev has many fantastic movies to his credit, as a cinematographer. His cinematography is refreshingly different and you would know what I mean if you check out his work in the following films: Drishyam, 7th Day, Memories, Anarkali among many others. 'James and Alice' is not just a love story. You have a solid script and a refreshing format that takes every scene in this movie from strength to strength. James (starring Prithviraj) is a struggling, but talented painter-turned-ad maker who is married to Alice, the daughter of a rich NRI. They fall in love and tie the knot against the wishes of her NRI father (starring Sai Kumar). So far, it's nothing new. But wait - it's not what you think it is. The story of James and Alice is played out in a realistic way and perhaps unparalleled in Malayalam cinema where a love story is brought through to its most important scenes with a hero inhabiting Heaven instead of earth. While a comparison seems unfair at this point, especially as this is Sujiith Vaasudev 's debut direction, I would say that it is perhaps only the veteran Director Padmarajan who has successfully pulled off something on these lines in his film 'Njaan Gandharvan'. Still, the director didn't risk transforming a hero to becoming an inhabitant of a heavenly abode - he did the opposite, which is somewhat still more believable because of the strong mythological ethos that we as Indians are familiar with. 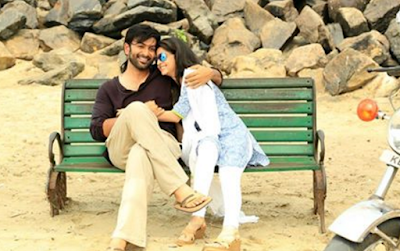 Sujiith Vaasudev has crafted every scene in this film with painstaking attention to the finest nuances and details of what happens when two people fall in love and later, perhaps, out of it. Prithviraj is brilliant as James. He reveals different facets to his personality as a man in love, a husband who is struggling to keep the family financially sound and as a father. Vedhika's graceful yet vulnerable demeanor brings strength to every scene of conflict throughout this movie. From the first scene till the last, the two actors effortlessly bring out the grey, difficult-to-like shades in 'James and Alice' in a powerful way. Also, I liked the fact that the story does not give either James or Alice more weightage. It lets you witness their turbulent moments so that you can examine your own as a witness, which makes the impact of this story telling more realistic and unique. I liked how relationships are played out in this movie. For example, the realistic portrayal of James' friendship with his lady colleague. It is a fact of life that more men and women colleagues share their thoughts and vulnerabilities with each other more clearly than with their spouses. In several scenes, James reveals his innermost thoughts, almost personal secrets, to his female colleague and she understands his struggles better than his wife. There is a scene where James shows her the room that he has converted into his personal sanctuary and the moments are intense, building up inch by inch, because of what he reveals, I almost expected a love scene to play out. It didn't. I was stumped. Respect! What evoked my respect is how realistically and respectably their friendship is depicted - a rarity in Malayalam cinema - it is platonic and sincere, paving the way for a thought to emerge that "Friendship between men and women at the workplace can be a productive process, not one that is fraught with the danger of turning romantic." Remember, the Malayalam movie 'Cocktail' starring Jayasurya, Anoop Menon and Samvrutha. My problem with the movie, brilliant though it was, is it takes a very objectified approach to the working woman. It plays to the gallery and a mistaken male perception that women who work are not always moral in their interactions. Most Malayalis love the rains. I am certain that you will love the song ''Mazhaye" in this movie. It is soothing and so lyrical to just listen to. You will love the cinematography in this movie. The scene that totally caught my breath into a state of utter stillness and fascination was - where an accident plays out. How can you possibly create a magical, cinematographic effect in a car crash scene? Well, Sujiith Vaasudev pulls it off effortlessly. When you place ice in a bowl of water, it melts spontaneously. That's what happens when you place love in a relationship. There is a natural, effortless harmony, a merging of thought, word and deed. There is a a realization of oneness that overcomes the conflict of egos and duality. This is what makes love so elusive. Few find can that tuning in, that harmony to keep a relationship going. That's what James and Alice is all about. Go watch this in movie theaters - or you will miss the magic of a brilliantly directed movie! great review!!! your review has tempted me to watch it! keep writing! !